Sher Vancouver is a social, cultural, and support non-profit organization for LGBTQ South Asians and their friends and families. Everyone is welcome in Sher. Sher aims to reduce the alienation, isolation, loneliness, depression, and suicidal ideation of our members. Many people who have nowhere else to turn and are in desperate situations turn to Sher Vancouver for support and assistance. Sher Vancouver celebrated our 10th anniversary in April 2018. Check out our You Tube video above which is only 6 minutes and 21 seconds long to learn about some of our highlights as an organization over the last decade. Please donate whatever you can. Every little bit helps. We are grateful for your support. Thank you. 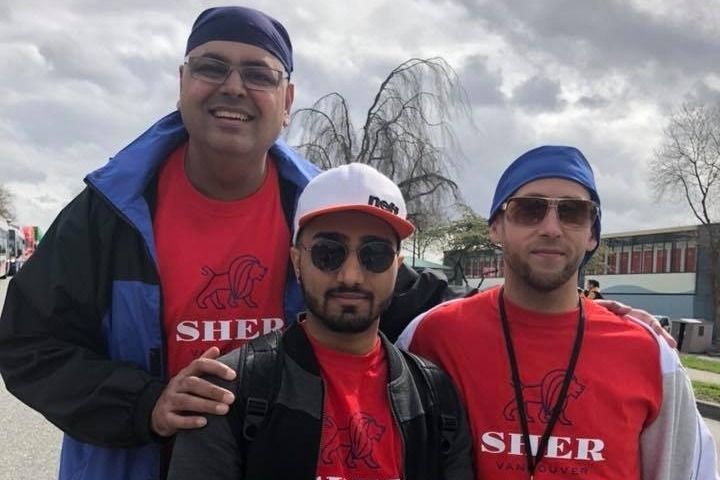 Sher Founder Alex Sangha (left) with Sher Vice President Kayden Bhangu (centre) and Sher Director Josh Soronow (right).